The 15th Annual MMOR Pet Parade is an annual fundraiser that raises funds which support The Haven No-Kill Animal Shelter's live-saving programs. Every dollar raised is critical to helping rescue, rehabilitate, and rehome abused and neglected homeless animals. Together we can end pet homelessness! 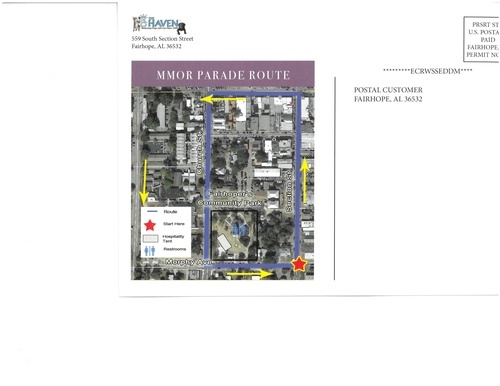 The streets in Downtown Fairhope will be closed from 10 a.m. to 2 p.m. This only applies to the area from Magnolia by the Hampton Inn to Johnson on Section & Brancroft to Summit on Fairhope Avenue. All other streets in the City are to remain open until 5 p.m. at which time streets necessary for the KOER Mardi Gras Parade will close. Saturday, February 3 at 1:00 p.m.